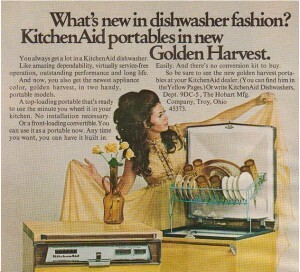 You are here: Home / Dishwasher / 70’s Appliances – Do You Remember Harvest Gold? 70’s Appliances – Do You Remember Harvest Gold? Today stainless is still popular in kitchen remodeling, but it is slowly losing its standing to oiled bronze. Thirty years from now we will all look back at these kitchens and fondly remember them the same way we are chuckling at the kitchens of the 1970’s. 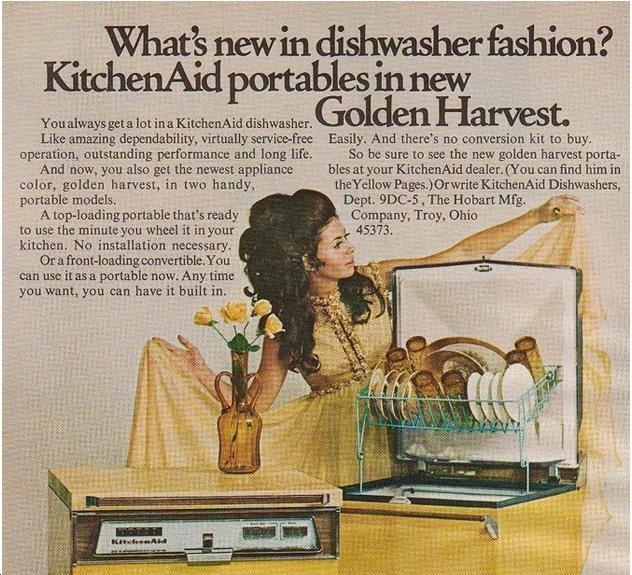 Although my mother chose the ever-so-popular Avocado Green appliances, another favorite of the era was Harvest Gold. This ad not only shows the wonder of the modern dishwasher, but also how important it was to dress appropriately for the job. Especially since this was one of the new portable dishwashers that she would be pushing around the kitchen. Notice the stylish brown tinted glassware? My parents had something similar that I thought was the height of elegance.